Three Geelong charities providing surfing for disadvantaged kids, unique drug rehab and food for the needy will compete for $15,000 next Tuesday. The charity leaders will present their pitch ‘shark tank’ style in front of a live audience at Federal Mills. Torquay youth worker Rachael Parker hoped the funding would allow her to take more disadvantaged children surfing. The former Melbournian founded Ocean Mind after moving in 2016, for children who have experienced bullying, disadvantage or mental health issues. “They come out of the water with huge smiles on their faces,” she said. Rachael had her first surf lesson in Cornwell, England, and loved it, before surfing at better-known beaches in Portugal. She found “silence” and peace from her lifelong battle with depression on the ocean. “I’ve spent 10 years working with homeless young people and people exiting juvenile justice system,” she said. Also competing for the $15,000 was Kane Nuttall, who beat his 12-year ice addiction through the gym and “strength inside”. Kane was already partying on ecstasy, speed and cocaine when he became addicted to ice in 2004, before people realised “how bad it was“. Sick of waiting lists and being handballed from person to person, he planned his own rehab. “I wasn’t born an addict and I’m definitely not going to die one,” he said. He now takes five to 10 people each week to the gym, pool sessions, cooking classes and on hikes across the You Yangs through his The Power In You Project. The project, which he runs at South Geelong, had helped people before, during and after rehab, he said. “Rather than them being thrown to the wolves, here’s a space where we can restore their self-worth. Kane hoped the $15,000 would help him expand the project from three to five days a week. 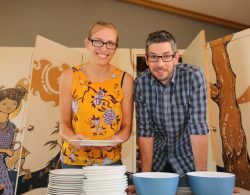 The money also could provide more nutritious food for people battling in Geelong’s northern suburbs, according to Norlane Community Initiatives’ Simon Reeves. “A lot of our projects are around food because it’s a big issue here,” he said. The group runs a weekly dinner for 60 to 70 people, a ‘People’s Pantry’ foodbank with 60 homes and weekly lunches. “Everybody cooks together, eats together and clean together at the dinner,” Simon said. The money could hire a community development worker to work alongside the group’s “passionate volunteers,“ he said. The Funding Network, which is providing the money, has raised $7.5 million in four years for more than 180 grassroots groups around Australia. Read the full article in the Geelong Independent here.